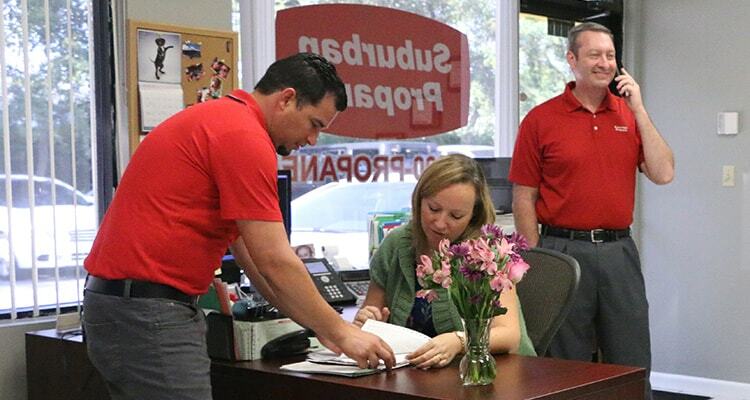 At Suburban Propane, when we say “Our business is customer satisfaction,” we mean it. We’re focused on it, and deliver it every day. As one of the nation’s largest propane and heating oil providers, Suburban Propane has the infrastructure to ensure a reliable fuel supply, even in the harshest of winters. Even though we are a national company we strive to provide each customer with individual service. All our deliveries are dispatched locally. With Suburban Propane, you get peace of mind with a dependable supply of fuel that’s there when you need it. With Automatic Delivery, your fuel deliveries are scheduled for you. You don’t have to check your tank, call for a delivery, or worry about running out of fuel. Your satisfaction, comfort and safety is our top priority. We feel strongly that there is no better way to meet this goal than with Automatic Delivery. Suburban Propane’s automatic delivery service is backed by one of the most advanced forecasting and delivery routing systems in the country. It allows us to deliver exactly what you need to stay comfortable all year round. Deliveries are scheduled using advanced calculations that measure your current usage, daily temperatures in your area, an estimate of your own future usage as well as other factors to determine when the next delivery of fuel will be needed. Of course, if your fuel usage changes, you should give us a call so we can adjust accordingly.